A growing recognition that many reefs are showing signs of limited or slow recovery after recent disturbances, and the accumulating spatial extent of degradation of reefs, has led to increased interest in the potential for restoration to play a role in future management of the Great Barrier Reef (GBRMPA 2017). Like coral reefs all around the world, the Great Barrier Reef is experiencing a sustained decline in key indicators of condition (such as coral cover) due an accumulation of local and global pressures. This is being met by an intensification of management efforts, with a strong focus on increased investment in addressing local sources of stress, such as degraded water quality, overfishing and crown-of-thorns starfish outbreaks. Increasingly, scientists, government, industries and communities governments are advocating active habitat restoration methods (Anthony et al, 2017, GBRMPA 2017, TNC 2017) as a complement to stress-reduction programs to accelerate recovery of local reefs, and to involve local communities in stewardship activities. 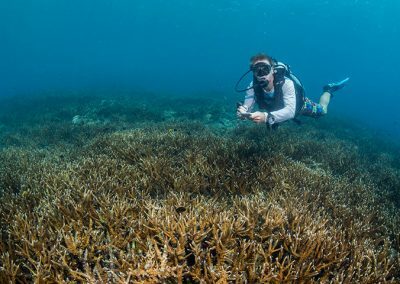 Reef Recovery on Magnetic Island is an innovative project in partnership with government, researchers, industry and community that aims to make a positive environmental, social and economic benefit for our local reefs and communities. 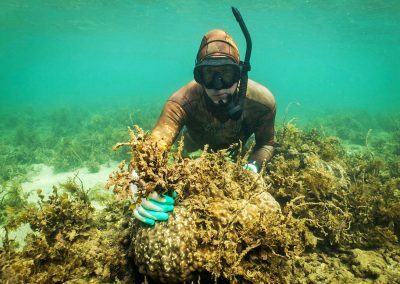 The project activities focus on the manual removal of overgrowing, weedy macroalgal on the fringing reefs of Magnetic Island. Magnetic Island nearshore reefs are home to substantial seaweed, potentially greater than historical levels. Reef Ecologic’s research permits which allow controlled collection of a limited amount seaweed to allow future corals space to grow and for juvenile corals to settle. While macroalgae is crucial for reef health, too much of it can upset the fine ecological balance of coral reefs (see science below). The project has environmental, social and economic benefits for the reef, community and industry. The potential environmental benefit of the Reef Recovery project are associated with improving future inshore coral reef health by removing seaweed.The seaweed we collect is measured and weighed and then taken to the Magnetic island Reef Guardian school for use as compost. The project aims to provide opportunities for visitors and the community to learn about and engage in inshore reef recovery and is an examples of positive stewardship where individuals and groups can make a difference at a local, reef and global scale. The research is permitted at 3 locations at Magnetic island: Nelly Bay, Picnic Bay and Arthur Bay. 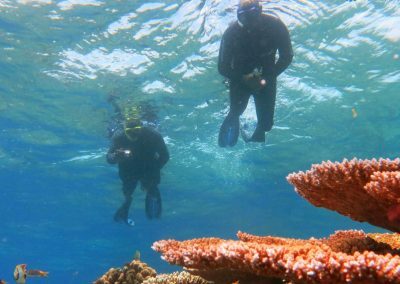 We undertake research on the reef flat in 0.5 to 2m of water depth. Magnetic Island is ideal as a site for this macroalgal removal experiment for a number of reasons. It is easily accessible for fieldwork, in most areas there is a dominance of macroalgae, and includes the opportunity for community, industry and tourism involvement. We undertake habitat research on coral and algae. The primary algae species is Sargassum spp. (a large brown algae which can grow to 2m in length) and Lobophora variegata (a small brown, ruffled, encrusting algae). The research design investigates reef habitat at 3 locations, methods of removal of macroalgae (hand vs tool) and scale of removal (2m2 4m2 and 10m2 plots). The primary research methodology is a Before\After study using the GBRMPA Reef Health Impact Study methodology (GBRMPA 2012). Coral cover on the fringing reefs of Magnetic Island has been relatively stable for the past 15 years while macroalgal cover has varied from 5 to 37% (Thompson et al. 2016). Anecdotal evidence suggests that Magnetic Island was once subject to significantly higher levels of water clarity and coral reefs around Magnetic Island have, in the past, supported high coral cover, despite high turbidity. Shallow reef flats and reef crests have always been subject to stands of Sargassum, but reef slopes below ~4 m were previously coral-dominated. Our research indicates that the average cover of Sargassum at Nelly Bay in 2016 was 30% and in 2017 was 53%, an apparent increase of 23%. The average cover of macroalgae at Arthur Bay increased slightly from 45% to 46%, however average coral cover declined from 26 to 7%. A pilot study for testing macroalgal reduction methodology at Magnetic Island was conducted in 2016 to test different removal methods. Different sizes research plots have also been compared beginning with 2m2 and scaling up to 4m2 and 10m2 plots in 2017. The project focusses on management outcomes including the development of a Standard Operation Procedure, partnerships, funding and communication. Social science is an integral part of the research with Dr Maria-Louise Bønnelykke conducting before-after attitude and perception surveys around reef knowledge, health and attitudes towards active involvement in reef restoration activities. Following involvement in the project, 95% of participants (up from 50% before participation) have shown a willingness to change their behaviour. Education is a key element of the project. All participants are provided with background information and a thorough briefing on the project to ensure a comprehensive understanding of the ecosystems function, the role macroalgae plays in this system, and how a balanced approach to active restoration is required for successful outcomes. We also raise awareness about climate change issues at interpersonal levels, requesting participants to complete their ecological footprint (www.footprintnetwork.org) and encouraging change to reduce their individual impacts. Communication; (with a particular focus on the RARE formula for change and conservation outcomes rare.org). A positive story like the reef recovery project has the potential to inspire reef stakeholders around the world. Therefore, a key element of the project we provide is guidance on scientific communication, engaging students to develop and distribute their own communications pieces about their involvement in active reef restoration on the Great Barrier Reef. It is an empowering and rewarding process that yields some sensational outcomes. The project was established through partnerships with the Great Barrier Reef Marine Park Authority, Queensland Department of Primary Industries and SeaLink Queensland to determine strategic and operational objectives, permits and reporting. We work closely with academic bodies including James Cook University and the Australian Institute of Marine Science so that our research is mutually beneficial and there is no negative impact or overlap with existing research sites. The Reef Recovery team work closely with a broad cross-section of the community including the Townsville Local Marine Advisory Committee and the Wulgurukaba traditional owners. We have worked closely with edu-tourism interests including Reef HQ, Sealink Qld, Bungalow Bay Koala Village and Magnetic Island Tourism on the links with education, research and tourism. The Reef Recovery team have recently established a partnership with Port of Townsville to focus on research and sustainability of marine environments. At an international level we engage with AUIP Study Abroad programs and American universities to share knowledge, make a difference and change behaviour so that we are all more sustainable. Successful reef recovery projects are long-term commitments. There is potential for reef recovery and reef restoration practices from this project at Magnetic island to be scaled-up and used widely by government, scientists, tourism, industry and citizen science to benefit other Queensland communities as well as Australia and international coral reefs. Individuals and groups currently participate by signing on as research assistants for their visit. Reef Ecologic currently works with AUIP Study Abroad program groups who participate in the reef recovery project. We also conduct community events where anyone can get involved and help improve the health of Magnetic Island’s nearshore reefs. These are usually held in conjunction with annual events such as World’s Oceans Day or Reef Check’s annual Reefblitz events. Check out Reef Ecologic’s Facebook page for upcoming event dates and locations. Reef Ecologic have extensive experience in the delivery of informative, high quality capacity building workshops in science, management and reef restoration. The team has delivered over delivered over 25 reef restoration and recovery training programs, multiple youth leaders workshops and multiple international management and leadership programs as Department of Foreign Affairs and Trade Australia Awards. 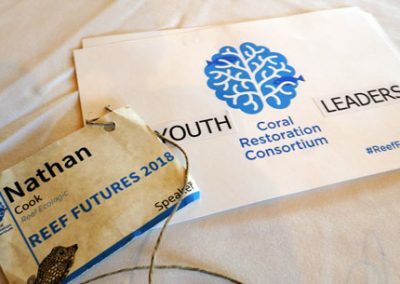 Reef Ecologic were proud to share a wonderful opportunity with youth from Florida to be a part of an international coral reef restoration and interventions symposium in December, 2018. This was a fantastic opportunity to engage a select few of the next generation to discuss restoration options for the coral reefs and how they may become active participants in future restoration initiatives. Anthony, K., Bay, L.K., Costanza, R., Firn, J., Gunn, J., Harrison, P., Heyward, A., Lundgren, P., Mead, D., Moore, T. and Mumby, P.J., 2017. New interventions are needed to save coral reefs. Nature Ecology & Evolution, 1(10), p.1420. Aronson, J., Alexander, S. (2013). Ecosystem restoration is now a global priority: Time to roll up our sleeves. Restoration Ecology. News Report from CBD COP11. Maggini, R., Kujala, H., Taylor, M.F.J., Lee, J.R., Possingham, H.P., Wintle, B.A., Fuller, R.A. (2013). Protecting and restoring habitat to help Australia’s threatened species adapt to climate change, National Climate Change Adaptation Research Facility, Gold Coast, 54 pp. Thompson, A., P. Costello, J. Davidson, M. Logan, G. Coleman, K. Gunn, and B. Schaffelke. 2016. Marine Monitoring Program. Annual Report for inshore coral reef monitoring: 2014 to 2015. Report for the Great Barrier Reef Marine Park Authority. Australian Institute of Marine Science, Townsville.133 pp.